Cucumbers and zucchini are rewarding plants to grow in the vegetable garden because they tend to produce massive yields. But cucumbers and zucchini are large, sprawling plants and can take up a lot of valuable real estate in your vegetable garden. If you have a small garden or just want to use your space more effectively, you can train your zucchini and cucumbers to grow up trellises. Growing cucumbers and zucchini on trellises also allows for better air circulation, which helps prevent disease. Install trellises in your garden before planting your cucumbers and zucchini to avoid damaging the plants' roots. Cucumbers and zucchini need a trellis that is at least 3 to 4 feet tall. Plant cucumber or zucchini seeds or transplants at the base of the trellis. Transplants should be placed 8 to 12 inches apart. Seeds should be sown to one every 2 or 3 inches, then thinned later to one every 8 to 12 inches. Spread a few inches of mulch, such as dried leaves or shredded straw, at the base of the plants to block out weeds and retain soil moisture. Wrap the zucchini or cucumber tendrils around the trellis as the tendrils emerge. This is usually when the plant is 6 to 8 inches tall, a few weeks after planting. Continue to train the plant up the trellis as the plant grows. Make sure that fruit-bearing vines are well supported so that they do not tear off as the fruit matures. Use garden wire or twine to fasten any wayward vines that do not want to cling to the trellis. Usually, though, this won't be an issue. 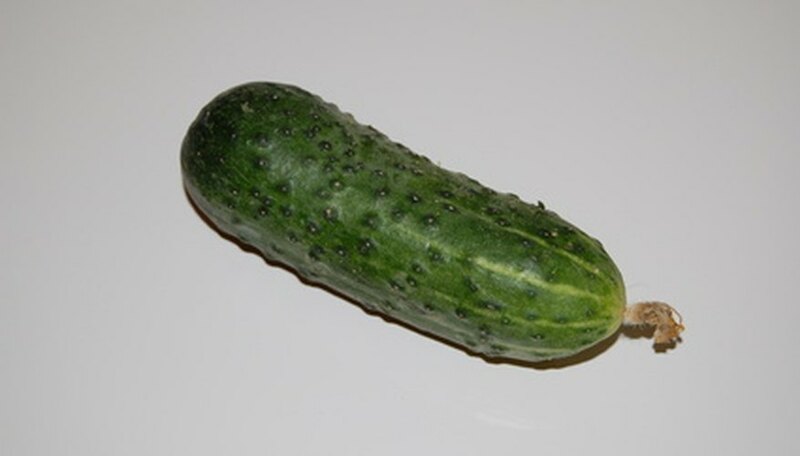 Cucumber and zucchini are planted in your garden after the danger of frost has passed. Gardeners with long growing seasons can start the plants from seed, while cold climate gardeners will want to use zucchini and cucumber transplants. Plant cucumbers and zucchini in an area that receives full sun. You can also train cucumbers and zucchini to grow up a wire fence.